The No Zoo-Like Tour, or rather a guided visit. Soweto Tour by Taste of Africa, we offer a no zoo-like tour, we would rather have our guide disappoint you, through what you may believe is their lack of knowledge, regarding what you may have read on the internet, than restrict his, or her, expression, of how they see South Africa and our history, while allowing others in the community to interact with you. This blog is aimed at giving the visitor an opportunity to understand the areas that we will cover during the visit, allowing less wasted time, by needing to listen to the information while experiencing the magic. Following our successful introduction to the Soweto Walking Tour, from today, we only offer the one option, but rest assured, for those who still require the local taxi transport to assist, your guide will be very aware of your needs, and ensure you are comfortable. The 1924 civilised labour policy, in theory giving preference to the white, was aimed at ‘not requiring’ the local blacks within the mining, railway, and municipality ‘imported migrant labour pool’. “The South African labour force only comes from the Eastern Cape. This area was defeated by the English, in conjunction with their allies the Mfengu group, off which colonial leadership structures were put in place, those who were Christian and civilised were educated and favourably considered for employment, and, off this basis, the recruitment took place for the mines and municipalities, the educated and the leaders, influencing the ‘recruitment’ for the system. 1903 Apartheid installed thanks to the mining industry, following the Anglo-Boer War, the English used many ‘unemployed’ military personnel to install structures of registration of the African Male in the old Transvaal and OFS. Gold Mining Industry we reflect on Labour abuses, and what Kaalvoet considers as motivation to manipulate governments to legislate, and to control the ‘uncivilised’ African masses. “They used the Mozambican ‘slave labour’ supply as the vehicle to suppress cost of labour from other areas, bringing Lesotho, a British Protectorate into the loop. Lesotho was a highly productive farming community, till their labour controllers changed them into a cheap labour supply. By 1903, the mining industry employed forty-five thousand labourers, and only fifteen thousand from the Eastern Cape, the rest from Mozambique. Until 1902, the Gold Mining Industry used predominantly labour supplied from Mozambique. I refer you to an earlier post on the Labour Supply, Part 1, please follow into Part 2&3, where we discuss the Coloniser, through the influence of the Gold Mining Industry, to keep wages suppressed. *It was only in the 1930s, as Afrikaner nationalist politicians under the leadership of D.F. Malan sought to mobilize political support along ethnic lines through the building of new class alliances, that the central government took steps to solve the poor white problem in the rural northern Transvaal. *In the early 1930s, when depression and drought threatened to overwhelm the farming sector, the government supplied white farmers with cattle feed and financial aid. Similar aid was not extended to African farmers whose ability to market their grain crops was severely impaired by the high mortality amongst draught oxen and donkeys. Most importantly, large-scale government-sponsored land settlement schemes were introduced to relieve the pressure on the overgrazed northern cattle farms. *But the settlement of poor whites on over 36,000 morgen of irrigable land, particularly along the upper Levubu, required the removal of thousands of African tenant farmers. At the same time tenancy relations started to turn against African squatters as the price of land climbed, from an average of 27s per morgen in 1918 to 34s in 1933 with the government paying as much as 180s for irrigable land on the upper Levubu. As the price of land rose, white farmers decreased the amount of land available to tenants and limited their rights to graze livestock. *We are gradually being dispossessed of the land which we and our ancestors, from time immemorial, occupied. Daily we see big parties emigrating from their old homes (because the farmer has bought the farms and requires them to work) to places they might live in security and with freedom. But alas! such a place is nowhere! They may perhaps go to the locations but they will experience in the course of time that they are in no better position as the locations are congested and barren of vegetation. What we see as the global market today, finally took control of the South African market during the period 1930 to 1936. The origins of what Kaalvoet refers to as the Global Market, alternatively the “Importers and Exporters”, are the wealthy families of the Western Capitalist World. During the early 15th Century, the world wealth, was dominated by the Asian / Muslim groups, off the Spice trade into Europe, they linked the mineral and animal products and wealth of Africa. The Age of Discovery was born, the Western Capitalist World, under the banner of Christianity, the ventured to fond access into this wealth, by rounding the Cape, discovering the New World, the Caribbean and Americas in the process. These investors, importers / exporters, the Dutch East Indies Company, English East Indies Company, accessed the Spice Trade, Silk Trade, and as the New World was developed, these importers / exporters, developed a very lucrative business model, their ships moving Slaves from Africa on one leg of the triangle, then Agricultural Products from the New World, to Europe on the second leg, and then building material and equipment on the third leg of the triangle, from Europe to Africa. Spice, Silk, Cocaine, Slaves, Ivory, Sugar, Tobacco, Coco-Cola, Cotton, Gold, Diamonds, brought these investors, importers / exporters great wealth, wealth that still resides with them today, plus the control of the production and distribution, of virtually all our consumption requirements. During the 1870s, land in the Transvaal and OFS, had not been surveyed and then, following the Discovery of Diamonds and Gold, during the 1880s these importers / exporters purchased large tracts of land in these Boer Republics, and they became the wealthy #LandOwners, extracting wealth through rental and sharecropping, or as was commonly referred to as “Kaffir Farming”. What brought the Final years of Black Freedom 1930 to 1936, quite simply, the depression, triggered by the collapse of Wall Street, October 1929, which caused the collapse of the New World Agricultural sector, unable to continue the supply of Agricultural Products on the second leg of the Triangle to Europe. The Importers and Exporters, the Global market, already owned the agricultural land in the Transvaal and OFS, and switched their supply chain for Europe to South Africa. What takes place between 1930 to 1936, is a business model where the importers / exporters are selling off portions of land, without the mineral rights, to young Afrikaners under ‘contract’, funded by the new banking system that bring with it the bond system, compound interest system, financing their equipment, seed, fertiliser, and teaching them to farm. Sixty years earlier, black farmers controlled the food chain for the majority of our population, since 1994, it is accepted that the majority of emerging farmers have not been successful. Why did the Boer, established during 1930 to 1936 succeed? The Importer / Exporter, required them for their business interests and for this reason, the ‘contract’ that was entered into with the young Afrikaner farmer, included the importer / exporter purchasing all the crops produced by the Afrikaner farmer, already controlling the railways, the ports, they established ‘co-operative facilities’ in the farming areas, purchased all the produce, exported to best quality, sold the 2nd grade to South African whites, and the lower grades were sold / fed to the blacks. This ensured the success of the emerging young Afrikaner farmers, a system that should have been introduced to our black emerging farmers in 1994. Kaalvoet attributes the removal of blacks from their farms, to the importer / exporter, and not the Government, why? As South Africa’s industry and mining started to develop, slave labour was needed to produce, but more importantly, the importers / exporters, having invested in the young Afrikaner farmer, needed to remove the competition by the black farmer who till 1930, had controlled the cereal market, and ensure profits. This is what has taken place in Townships and Rural areas as the Global Market has invaded the ‘black economy’. As the world slowly recovers from the depression, America agriculture recovers, with South Africa producing maize, the importers ‘ exporters need to find a market for corn, and although WWII takes its toll, the woman entering the workforce, brings opportunity. After vitamins were discovered, it did not take long before, in the 1940s, breakfast cereals were fortified and heralded as a source of every vitamin under the sun, making breakfast that much more important, according to advertisements at the time. The cliche that breakfast is the most important meal developed from those early days of cereal. It was also around that time that women were entering the workforce in droves during the war, and needed something quick yet nutritious to feed the kids in the morning. Maternal guilt was used to market cereal as the best food to give to children, and underline the importance of eating breakfast. As we enter the 1950s, so the importer / exporter, the global market, controls everything think we eat or drink, all in the interests of their profit. Kaalvoet has a theory that land reform, is impossible in Africa, but you will need to comment and ask for information, should you wish the theory, before the Reflections on South Africa history gets there. After #AngloBoerWar bywooner existence, In Consider the Verdict, I have been quoting from -The Emergence of Ethnicity Among the Tsonga-Speakers of South Africa -Patrick Harries, and before I continue, I need Kaalvoet to comment on what is taking place in 1930. Here I introduce the concept of the Anglicised Afrikaner, and what we will eventually identify as the Anglicised Africanist, those who move into the “Queen’s Court’, to administer the Colony and protect the wealth. Although it is only 1930, the Afrikaner, National Party, in coalition with the Labour Party, (Arbeidersparty) was governing the country. The Arbeidersparty was formed in 1910, the party received support mostly from urban white workers and for most of its existence sought to protect them from competition from black and other non-white workers. In 1930, as the world depression takes root, the government moves to intervene on the growing poor white problem? *The destruction of northern Transvaal farms by the British during the Anglo-Boer War had pushed increasing numbers of already poor Afrikaans farmers into a marginal existence. In many instances landowners found it more profitable to enter into tenancy relationships with Africans rather than politically more powerful Afrikaner peasants or bywoners. Although large numbers of whites lived in conditions of extreme poverty in the northern Transvaal, they received little sympathy from the government and, considered ‘indolent, lazy and indigent’, were treated as a social rather than an economic problem. Kaalvoet will make a comment on the following quote, as we reach 1936, suffice to say that, the Government will during the next few years, be manipulated by the wealth of the world, to remove the blacks from the land, and develop those the considered ‘indolent, lazy, and indigent’ into the powerful Afrikaner Farmers, Boers, that they are today. But the growth of this African petty bourgeoisie was abruptly truncated in the 1930s as the government intervened in the northern Transvaal to halt the growing poor white problem. *In evidence given to the Natives Economic Commission of that year, (1930) it was stated that in the northern Transvaal over the previous forty years, ‘. . . [African] marketed produce has increased. This increase is considerably greater than the increase in population. According to another witness, ‘You will find to-day that [the Africans] have raised tens of thousands of bags of Kaffir corn purely for market purposes and the greater portion of that money which they get for their corn is to pay for land and to buy land. But the growth of this African petty bourgeoisie was abruptly truncated in the 1930s as the government intervened in the northern Transvaal to halt the growing poor white problem. *The government did however make available a large number of small farms on long lease and with the option of easy purchase in the poorly watered northern districts. But this merely compounded the problem, for by the early 1930s these uneconomic cattle farms had become desperately overgrazed and were occupied by large numbers of settlers subsisting largely on game and maize meal. #Initiation must stay and be respected, this call, supported by the video to the right, is a call to those Western Influenced people, who call for #InitiationMustFall. INITIATION, essential, any call for #InitiationMustFall is condemned. African culture for cultivation of child, from child to adult, part of the Initiation process, the preparation part, the essential part, and Initiation must never fall, it must stay and be respected. As a white exposed to the initiation process, or rather, the many successes of black adults who have been through the initiation process, I have been to advocate that young whites should be processed through the African culture of ‘child to adult’ development. A recent call for #InitiationMustFall, caused me to cringe, this call is typical of the Western Culture attack on African Culture and that Culture is archaic, cruel, abusive, and should be changed. All these calls exclude the all embracing aspects, of part of the condemned culture. For years I have listened to my black friends describe the process that the entire extended family, participate in, as the cultivate a child, from very young, to adulthood. Nettie and I are exposed to many rural communities, and we are very aware of the numerous children that are involved in daily chores, and yet, there a numerous children that do not participate. 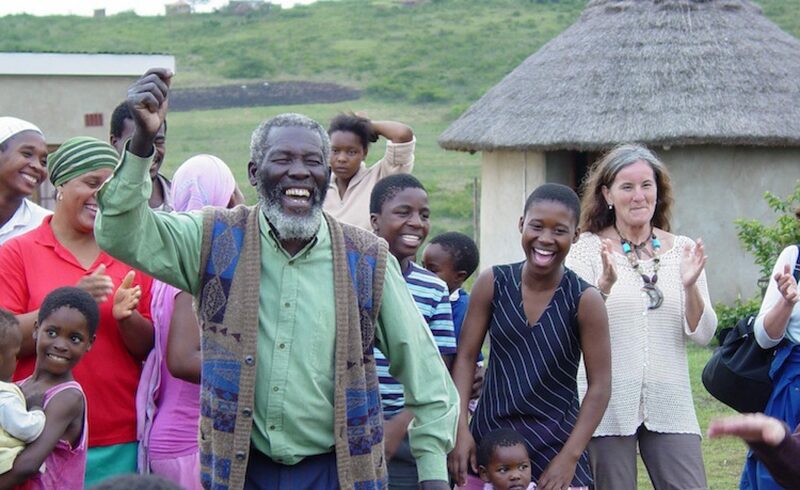 Then, during a visit to our Zulu Village in 2016, while casually chatting to an elder, we are attracted to a young child, four or five years-old, chasing the goats around the yard. My first reaction is to suggest to the elder that he should stop him, he continues watching him, and as we relax, we become aware of a slightly older brother, maybe eight years-old, watching, seemingly intent on getting involved in the mischief. Only when the elder child moves into a position and changes direction of the goats, do we become aware that they are herding the goats. I use my cell phone to take a few pictures, and watch how the eight year-old allows the four year-old to chase the goats on his own, only getting involved when his assistance was needed. Then, to our surprise, as the goats are moving into the goat-pen, the eight year-old stands far back, the four year-old continues moving them slowly forward, and then, an older brother, not seen before, moves closer to assist the child, and when complete, he helps to close the gate of the goat-pen. Not sure what was said between them, but the child walks proudly, a slight smile when he passes us. These children, even if they are not necessarily scheduled to go to the mountain, would graduate, if ever the decision was made to send them to the mountain. Any call for #InitiationMustFall, will negatively impact on the traditional cultivation of our children. The Erosion of the African Position during the period 1902 to 1930. *The Kafirs grow enormous and increasing quantities of mealies [maize]; quantities so much in excess of their own requirements that the district supplies more of this indispensable article of food for native labourers on the Rand fields than any other part of South Africa. *African production of cereals for the market was encouraged by both traders and the mines. Nor was the state willing to act against Africans who provided an important source of government revenue; in the years immediately following the Anglo-Boer War the direct taxes paid by northern Transvaal Africans to the government more than quintupled to £140,000. *It is clear that a relatively prosperous, if small, class of African farmers was emerging at the expense of their peers. Evidence for this lies in the purchase of land by individuals who themselves took on rent-paying tenants. In 1911 there were 2000 ‘Shangaans’ living on an African-owned farm in the eastern Transvaal and, five years later, there were some 10,500 Africans living on land held in freehold by Africans in the northern Transvaal. Some of these farmers commanded an annual income of £500 and virtually all had adopted the plough which, together with draught oxen and wagons used for marketing purposes, required a considerable capital investment. Some market-orientated cattle farmers had herds of up to 300 head. Thus by 1930 a number of African farmers had emerged who were able to rent out land and annually market several hundred bags of grain as well as fairly substantial numbers of cattle.